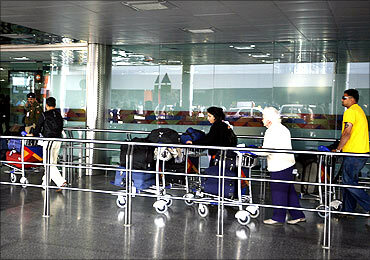 Rediff.com » Business » Hyderabad airport ranked world's 5th best! Hyderabad airport ranked world's 5th best! Hyderabad airport ranked 5th best in the world! Hyderabad's Rajiv Gandhi International Airport (RGIA) has been rated the world's number one airport in the category of airports handling 5 to 15 million passengers by the Airport Council International. The Hyderabad airport has also been voted as the fifth best airport worldwide. The RGIA handles about 6.4 million passengers annually. Commercial flight operations began from the Hyderabad airport from March 2008. 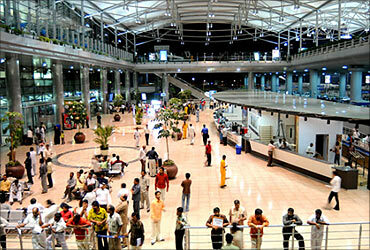 The Rajiv Gandhi International Airport is the second public-private partnership venture among Indian airports, after the Cochin International Airport. With one of India's longest runways (4260 metres), the airport is designed to handle 12 million passengers, more than 100,000 metric tonne of cargo and 90,000 ATM (air traffic movements) per annum in the initial phase. RGIA is also the first airport in Asia and second in the world to be awarded LEED (Leadership in Energy & Environmental Design ) Silver Rating for its eco-friendly design. Austin, Cancun, Nagoya, Jacksonville are the other airports that won in the 5-15 million passengers-per-year category. Image: Rajiv Gandhi International Airport in Hyderabad. In the Asia Pacific region, the New Delhi International Airport has been voted as best airport in terms of improvement. The award recognises those airports that have made the most progress in improving service quality. The 2009 passenger ratings show that despite the economic crisis, overall satisfaction at airports increased by almost 3 per cent worldwide compared to 2008. It is gratifying to see that 82 per cent of the airports were rated with stable or improved performance, the SCI survey said. Image: New Delhi International Airport. All the top airports hail from Asia-Pacific Region, a reflection of the region's strong customer service culture, airport management commitment to service delivery and the high quality of modern passenger facilities at each of these airports, the study said. One of the largest and busiest airports in the world, the Incheon Airport is voted as the world's best airport. It has been consecutively rated as the best airport in the world by the Airports Council International since 2005. It has received the full 5-star ranking by Skytrax, shared only by Hong Kong International Airport and Singapore Changi Airport. In 2009, Incheon International Airport had been voted as the world's best airport by Skytrax. The airport has unique luxury features such as a golf course, spa, private sleeping rooms, a casino, and indoor gardens. Image: Incheon International Airport, Seoul. Photographs: Courtesy, Incheon Airport website. With over 300 awards, the Changi Airport ranked as the second best airport, is truly Singapore's pride. Recognised as one of the best airports in the world, it has 80 airlines serving 200 cities in 60 countries. The airport now has an annual handling capacity of more than 70 million passengers. The Changi Airport handles more than 4,500 arrivals and departures weekly and over 37 million passengers a year. With over 40,000 square meters of commercial space, Changi Airport also has Singapore's largest shopping location. 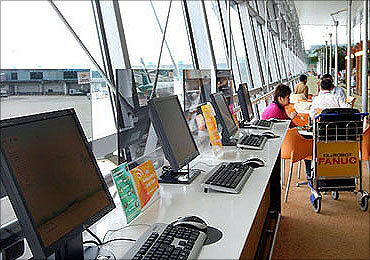 Image: Internet terminals at Changi Airport. Photographs: Courtesy, Changi Airport Group. The Hong Kong International Airport ranked third in the world, has won seven Skytrax World Airport Awards for customer satisfaction. About 90 airlines operate flights to around 150 destinations worldwide. 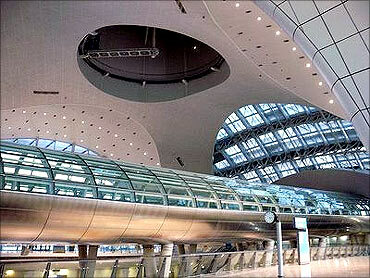 HKIA also operates one of the world's largest passenger terminal buildings. Direct ferry services are available from the airport to various destinations throughout the Pearl River Delta. The Airport saw a passenger movement of 46.1 million in 2009. 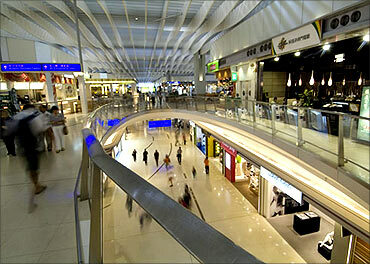 The Airport offers a great shopping and dining experience. Image: Hong Kong International Airport. Photographs: Courtesy, Hong Kong International Airport. 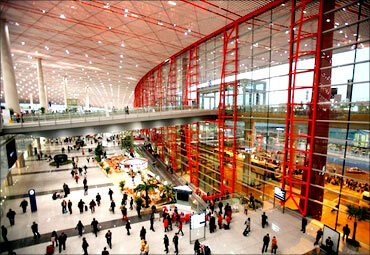 The Beijing Capital International Airport is the largest and busiest airport in China. In 2009, it won the Cond Nast Traveler magazine's World's Best Airport Award for factors such as cleanness, speed of security/immigration clearance and luggage handling. More than 5,000 scheduled flights are available to 88 cities in China and 69 cities abroad. Beijing Capital added the enormous Terminal 3 in 2008, the second largest airport terminal in the world after Dubai International Airport's Terminal 3, and the third largest building in the world by area. An indoor garden in the Terminal 3 waiting area is designed in imperial style. The T3 food-service area offers the best dining experience at the same prices as in Central Beijing. Image: Beijing Capital International Airport. Indian economy: Growth is back! Most livable cities: Vancouver tops, Mumbai 117th! Now, 'standing room' on airlines!